How to Store a Bicycle | Home of the Crofton Bike Doctor Blog! Has this happened to you? You purchase your new bicycle and you get it home and realize, you don’t have a way to properly store it? Proper storage of your bicycle will protect it while you are not riding it and keep it safely out of your way. So how do you store your bicycle? Of course there is the tried and true kickstand. They certainly do the trick and are great because they come with you where ever you ride. The one downside to the kickstand is if the bike does get knocked over they tend to fall onto the drivetrain side of the bike causing possible damage. Another problem with the kick stand is that they don’t work on every bicycle. As a general rule kickstands don’t work on road bikes and the majority of riders don’t have them installed. 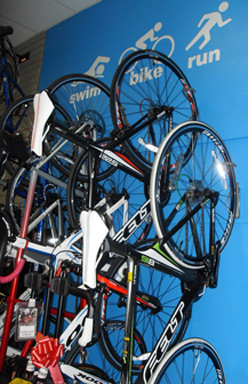 As the name implies wall storage stores the bicycle on the wall, usually hanging from one of the wheels. Most of the time people hang the bicycle from the rear wheel. I really like this type of storage as you can mount lots of bicycles in a small area of space, staggering the bicycles as needed. I also find it easy to be able to get the bikes down off the wall. The downside to this type of storage is that the bikes stick out several feet from the wall. our BMX section) from the store or using a more advance type of hook that usually comes with a front wheel holder. We really like the Delta Brand for this type of storage and use them in our triathlon section. is that the bikes do not stick out from the wall as much as the hanging method but they take up more space along the length of the wall. For younger people and people of a shorter stature may find this method of storage a little easier to get the bikes down from the wall. If more space is needed you can store bikes above one another. consider a bicycle rack that holds multiple bicycles for your garage. Another style of floor storage is an arch style that holds the rear wheel of the bicycle. Some of these are more stable like a Saris Wheel Arch and some come on rolling wheels with the arch. 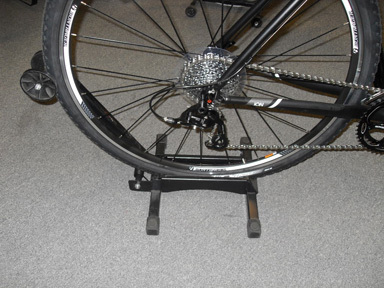 Most are adjustable in width so that they can support a mountain bike or a road bike wheel. Our favorite style of floor mount storage is the Feedback RAKK Display Stand. What is great about the Feedback RAKK is that you just simply roll the rear wheel of the bike into the rack. No fuss no muss. These racks also come with an attachment that allows you to link multiple racks together. One final advantage of this type of storage is that you can store the bicycles parallel or perpendicular to the wall. This style of storage is freestanding and doesn’t attach to the wall. Freestanding storage is great when you don’t want to attach anything to the wall but still need the ability to store your bicycle inside. The Saris Bike Bunk works well behind a sofa where space is limited. The Topeak Dual-Touch stand uses suction cups and runs floor to ceiling, comes in two or four bikes and also works well behind furniture. The Dual-Touch racks work well in situations that have taller ceilings. We really like the Feedback Velo Cache that comes in a two bike or a four bike version. We currently use the two bike version in the store. 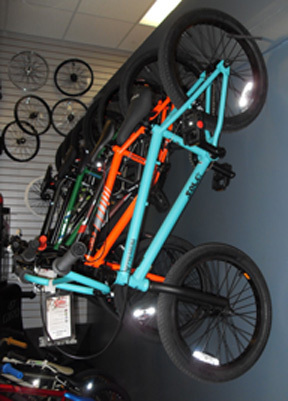 If you have an area that you would like to store your bicycles that have high ceilings there are bicycle hoists that will lift the bicycle right out of the way and up to the ceiling. Bicycle hoists us a hook onto the handlebars another under the saddle and with the help of some pulleys the bicycles can easily be pulled to the ceiling. For long term bicycle storage a bicycle cover is a nice addition to protect your bike from the elements. When considering your bicycle storage needs don’t forget to think about where you are going to keep your cycling accessories. Most of the freestanding racks have options for baskets to store your gear in. Some of the wall mounts racks have hooks or shelves that come with them to hang your helmet from, place your shoes and gloves in. If your preferred method of storage doesn’t have a shelf it is easy to add one, just don’t forget to plan for it when considering the space. No matter what your storage needs are we have a solution that will keep your bicycles safe until you are ready to ride them again.